If you're the "hostest" with the "mostest". Contact us today! We love Cake! We love Sweets! We also love "fresh" ingredients. "Real" butter, milk, eggs and natural flavors such as: Madagascar Vanilla beans, lemon oils and creams which are whipped up to bring you the most delicate and fluffy cake and cupcakes possible. No one cake will be the same: Each design will be unique. We can tweek and add any color or design. But your design will be strictly for you. Ok!...Custom cakes do come at a "little" custom price verses your traditional "Store" bought cake. Most cake designers or "WE" Divine D'Zine make our cakes and cupcakes strictly from SCRATCH!....and MOST or ALL details take up to a week to complete on most cakes you see on our site. Meaning a 7-10 day notice on MOST cakes is very sufficient. You don't have to sacrifice "Sophistication" or "Elegance" to have a nice simple cake at your event. We can make cute and small "Show Stopper" cakes affordable. You just have to be true to your budget. And true to knowing what real Art and Cake design really is. And how much time go into designing a cake especially for you. Contact us we will love to help you the rest of the way for your event. Our Sweet Table Packages is an awesome way to "WOW" your guest with a Scrumptious variety of sweet treats. And a Time Saver for the Hostess! 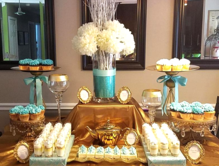 Cake Stands and Candy Jar Rentals, Dessert Trays, Platters, Basic design and décor of the table and Breakdown. Within 20 miles outside of National Harbor. ​Please Call to Inquire about Package and Pricing Options. Let us "D'Zine something sweet for you!.